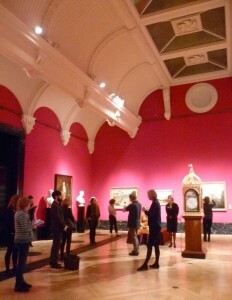 The Queen’s Gallery has two exhibitions on at the moment. The larger exhibition space is showing Scottish Artists 1750-1900: from Caledonia to the Continent which I also saw at the Bloggers’ Breakfast preview last week. All the pictures come from the Royal Collection and the exhibition’s subtitle is well chosen – Sir Walter Scott’s phrase ‘Caledonia stern and wild’ comes to mind. I’m concentrating on just four of the paintings which George IV, Queen Victoria and Prince Albert bought that show their love of Scotland. The curator, Deborah Clarke, gave us a most interesting talk about the paintings in the Scottish Artists’ exhibition and the stories behinds them. One thing I love about the Bloggers’ Breakfasts is that we are always given a wonderful overview about the paintings on display, told by someone who really knows their stuff and can get it across with wit as well as erudition. As you can see, the walls are now quite a bright red; it’s a bold choice of colour but the room is big enough to take it. The vaulted roof is painted white and the result is impressive and shows off the paintings splendidly. 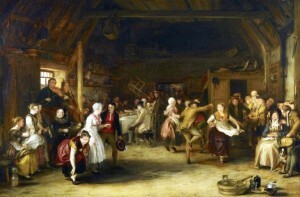 Sir David Wilkie was Queen Victoria’s favourite Scottish painter and he is well-represented in the exhibition. His early career owed much to George IV who commissioned The Penny Wedding painting in 1818 and paid him the phenomenal sum of 500 guineas. The Penny Wedding shows simple country folk enjoying a traditional wedding where the guests contribute a penny each and any money left over went towards the couple’s new home. The violinist by the window is the famous fiddler Niel Gow. The picture’s moral is that money isn’t everything and that ‘the salt of the earth’ can be as generous and hospitable as the richest in the land. Queen Victoria and Prince Albert had driven through the very same pass. 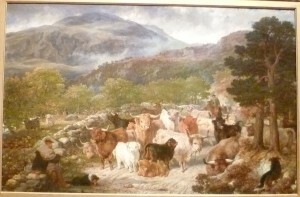 The Queen had noted the ‘endless droves of wild-looking, and for the most part extremely small, shaggy Highland cattle with their drovers and their dogs – most wild and picturesque.’ She was obviously thrilled and she commissioned the painter Gourlay Steell to capture the scene. And Gourlay Steell did not let her down. Note the stormy sky over the mountains with the mist coming down, not to mention the Highland cattle milling around in a threatening sort of way. Queen Victoria bought this painting (one of a pair) as a Christmas present for Prince Albert in 1848. 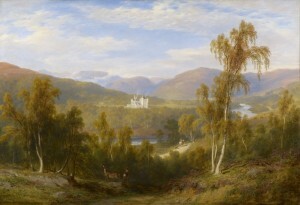 Albert had acquired the lease of the Balmoral estate only the previous year, so Giles’s view shows the old original castle standing proudly amid the wooded landscape going down to the River Dee. He captures the soft Highland light beautifully. This is the companion piece to A View of Balmoral. Lochnagar is bathed in luminous light with the Gelder burn in the distance. 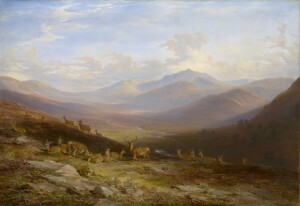 In the foreground, a stag stands proudly, surrounded by his hinds, demonstrating that he’s the monarch of the glen – and ee know that Prince Albert enjoyed deer stalking. He must have been thrilled by his Christmas presents. It is a wonderful exhibition, with a far wider range of paintings that I have been able to cover here, including works of Scottish artists abroad, as well as luminaries like the court painter, Allan Ramsay. I hope you enjoy this glimpse into the delights offered. Photos of The Penny Wedding, A View of Balmoral, and A View of Lochnagar, Royal Collection Trust / © Her Majesty Queen Elizabeth II 2016. Other photos by Elizabeth Hawksley.